wardrobe remix column in adorn magazine! 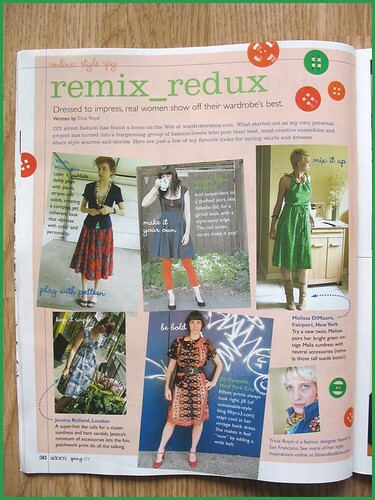 i just wanted to share: i now have a wardrobe_remix column in adorn magazine! the article features fabulous photographs of stellar, stylish wardrobe_remix participants. this is the first of a continuing series, featuring spring-ready skirts and dresses, and the photographs of vlada, isabelle hayes, melissa di mauro, jessica rolland, and jill danyelle (of the great sustainable style blog fiftyRX3). the article is in the spring 2007 issue…i’m really proud of how it turned out! thanks, adorn! You are such a superstar! I’m so glad that you’ve had so much success with Wardrobe Remix…it’s such an amazing community! Hopefully once the weather warms up a little more around here I’ll be more inclined to post regularly again…I miss taking pictures. It gives me an incentive to dress in something other than just jeans and a t-shirt. I’m going to have to check out the new Adorn…I’ve been meaning to read it anyway, but I’m so bad about picking up magazines. Thanks for giving me an excuse! Ah, that’s awesome! I’m so glad you have that gig…you deserve good things. I want to run out and get a copy asap!! haha, were the buttons your idea, or did the layout person pick up a psychic message? the red-orange and green combo is just so you 🙂 congratulations! Fabulous! I look forward to the mag arriving in Australia. Fantastic! I’d heard of ‘Adorn’ but hadn’t really checked them out. After seeing their spring preview, it truly looks like 9.99 well spent. February 7, 2007 - 4:19 pm S.